Sure it’s mesmerizing. 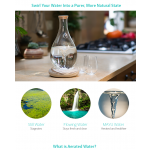 But more importantly, it turns and keeps your water fresh and healthy in its natural flowing state. 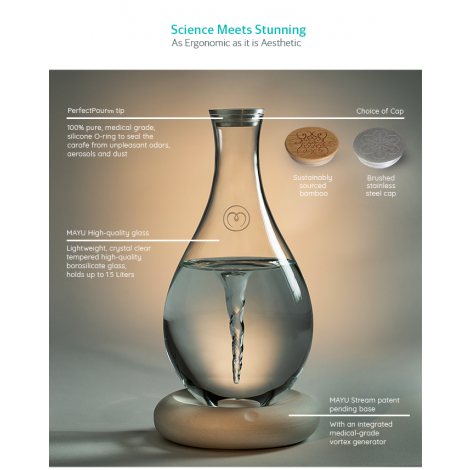 Because when water is moving around, the oxygenation triggers subtle chemical chain reactions that cleanse it of compounds that really shouldn’t be there in the first place. The premise is simple and backed by prominent scientific literature. When water sits still, many dissolved contaminants remain trapped, while aerating it with a flowing motion releases contaminants and keeps it oxygenated, fresh, and clear. When water is kept flowing it aerates, like a fine wine exposed to air. 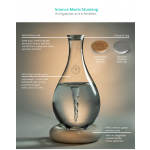 The swirling motion introduces atmospheric air into the water dissolving in fresh oxygen. It begins a process that makes water healthier, more delicious, and strips it of harmful compounds. 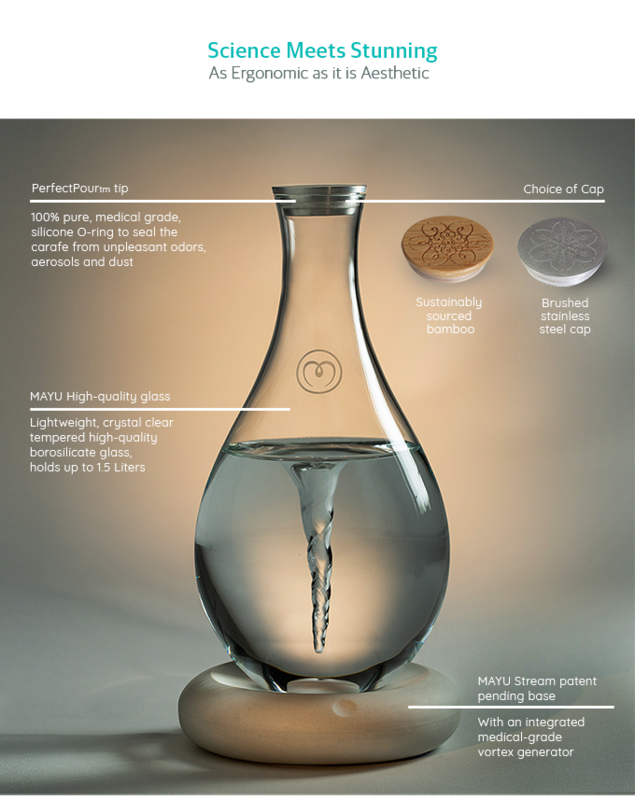 MAYU's vortex vessel does this exact natural process, in around 9 minutes. Reduce plastic waste by buying less and decreasing the demand for single-use plastic. 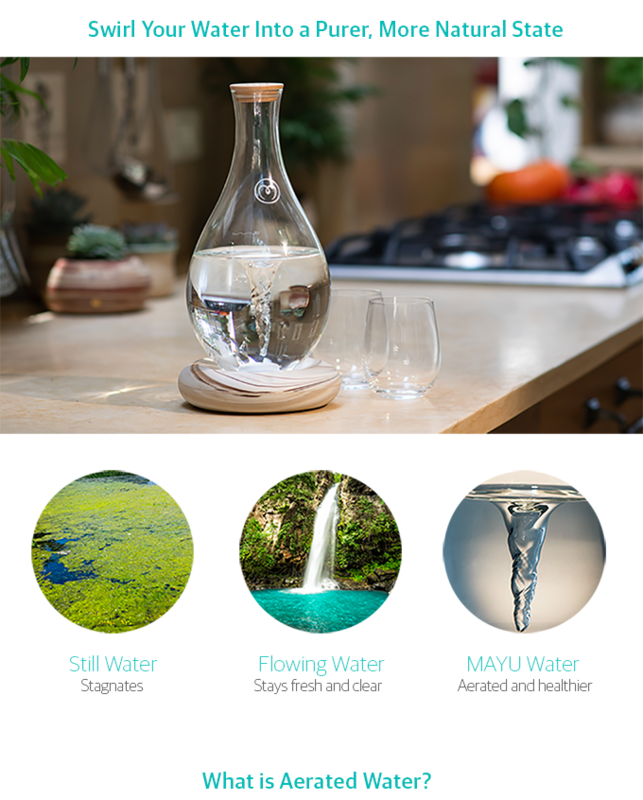 With MAYU, you can drink water straight from the tap. 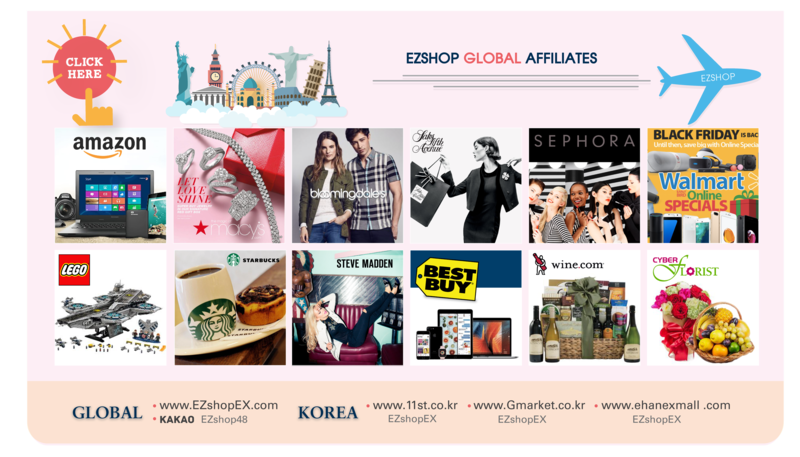 Which will taste better than the water shipped to you from across the globe. All structure materials are 100% recyclable and are environmentally responsible. Controlled by solid state load cells that senses the presence of the vortex vessel and starts the swirling motion automatically, calibrating the volume and speed according to the amount of water in the vessel for a constant perfect vortex. The vortex will keep swirling for up to 2 hours unplugged. Fast and easy. Connect in a snap. Just touch it to get your water swirling. Aeration removes volatile tastes and odors from water by stripping them as gases. Which, as indicated by independent studies makes the water more delicious. In particular, one of the main culprits behind bad water odor and taste is hydrogen sulfide, a compound that is readily removed by aeration. MAYU increases the water consumption in households in more ways than just enhancing water and making it more delicious. It’s purely anecdotal, but since sharing MAYU with friends and family, many have commented that they find themselves and their children drinking a lot more water simply thanks to the beautiful visual reminder in their environment. In a world where attention is scarce, simple awareness and visual cues may be the keys to healthy hydration. MAYU’s vessel is easily washed and cleaned just like any other water pitcher, and is dishwasher safe. The porcelain base is stain-resistant. The World Health Organization’s Recommendation: The WHO research and guidelines for water treatment emphasize the importance of aerating the water as a process of neutralizing toxins as well as improving taste and odor. in some countries, aeration is a mandatory process for all municipal drinking water. The US EPA has identified many types of organic compounds in our water supplies. Some of the organic compounds are volatile, and, as a result, aeration would be a good process selection for removing them from the water. Some common volatiles includes trihalomethanes, chlorobenzene, trichloroethane, tetrachloroethylene, and trichloroethylene. Aeration can achieve up to 95% removal of these compounds.